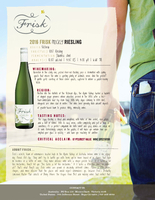 Frisk Wines - Prickly - Alpine Valleys Riesling and Rosso. Pristine, cool-climate Riesling grown at the foot of the Victorian Alps in Australia. Sumptuous silks to slip into. Blow-your-mind craft beer cocktail list. A Paris Design Week fave. Looks simple. Looks can be deceiving. Because everyone has room in their closet for one more pair. Fashion, with a noble cause. It must take you to the moon, right? The travel phrases you never knew you needed, until now. Frisk Wines are grown in decidedly different climes. 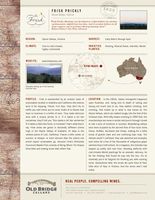 Mostly high in the Alpine Valleys of Australia. Sometimes deep in the verdant plains of Lodi, California. But always in places that are a little more obscure than the places you’d expect winemakers go, because our Brilliantly Conceived Master Plan consists of Being Where the Grapes Grow Best. Riesling, Dolcetto, Merlot, and occasionally Grenache. Always with a provocative prickle that will invigorate your palate like an ice cube on a languid, summer spine. He eventually located his glass, and claimed he liked the way it “prickled his palate.” We had a taste for ourselves, and agreed. Looked to the boss, who also agreed. Winery intern redeemed. And so it was that hundreds of hours and thousands of dollars were not spent trying to come up with a name for our new wine. It sounds right; it feels right. And the boss went for it, which is the gold ticket, right? We’ve been called “mavericks,” “young guns,” and a lot of other things we can’t print for fear our mums will see, but basically, we’re an eclectic team of winemakers who believe wine is for enjoying. Period. Full stop. We don’t try to baffle you with terms you’ve never heard of. We just make delicious wine with a unique prickle to it. If it tastes a bit like nectarines, we tell you “this tastes a bit like nectarines.” If it tastes a little like limes, or minerals? That’s what we’ll say. But when it comes down to it, we think reading about wine is like painting about music. You should probably go try some at this point. We really do hope you enjoy it. We’d hate to have to get real jobs. That’s Not An Alp. This Is An Alp. In the 1850’s, Italian immigrants happened upon Australia and said: “This isn’t Pismo Beach at all. You got us lost didn’t you?” Being sick to death of sailing and having not much else to do, they started climbing. And climbing. And eventually ended up in what is now known as The Alpine Valleys, which are nestled snugly into the foot of the Victorian Alps. With lofty slopes climbing to 2000 feet, the mountaintops see snow in winter and punch through clouds to nab a slice of sunshine in summer. Ovens, Buffalo, Buckland, and Kiewa - making for a hefty dump of granite loam and one confusing topo map. Alas, our seasoned hikers weren’t confused; they saw potential and promptly sent home for a few of the indigenous grape varieties they’d left behind. Turns out the Dolcetto shaped up pretty well over time, blending perfectly with juicy Merlot fruit for an invigorating red. As for the Riesling that found its way into the mix, it’s so minerally you’d be forgiven for thinking you were gnawing away on a rock. Generations later, the locals are quite fond of their little slice of italy in Victoria. We think you’ll feel similarly about the wines. They'll get you through any dull reunion. This zippy Riesling is floral and weighted, with notes of lime sorbet, rose petals and a hint of fennel. With its racy verve, subtle complexity and just a tinge of sweetness, it’s a perfect companion for both sweet and spicy dishes... or simply on its own. Refreshingly complex on the palate, it will make you wonder how you emptied your glass so quickly - and have you reaching for another. Dolcetto, in Italian, means ’little sweet one’ & gives this wine its fabulous ruby hue along with black cherry & cinnamon characters. Merlot, a traditional blending grape, delivers loads of bright red fruits amid a juicy mid-palate that is the perfect foil to a gentle prickle. Together, they’re like PB&J – sweet and spicy, fleshy and firm, fruity and crisp. It’s kismet. slip-sliding down your throat. What are you waiting for? Pull the plastic out, let's get this show on the road! and give ‘em curry about bringing it in for you! There's no time for a picnic like there is on the weekend. So enjoy the outdoors and beautiful weather with a basket of goodies. Check out some of my favorite things to pack...and that definitely includes a bottle of FriskWines. @friskwines Cheers to you & to the weekend! Love your effervescent energy! @friskwines it did! We sold out of the Riesling and need more!Need to try your other wines! We'd love to hear about how you and Frisk Prickly hooked up. The good news is, in this day and age of über-connectedness we're likely to get back to you in minutes. The bad news is our online chat might be had while we're on the john. Need a few extra tools of the trade to close the sale? Head on over to OBC Wines - you'll find everything you need from pretty pictures to shelf talkers.